Hi everybody, I am here an other post from an other Region of India, It is such a fun to taste different spices from different cuisines, Blogging has brought me more of this lovely interact with people, food and cuisines of the world. I was looking for a Punjabi recipe in my books and then I noticed that I had a few recipes of Punjabi recipes from my cutting (rather my sis had cut some magazine sheets out for me when I went last time to India after I started blogging my family write down recipes from magazines, books, friends, TV shows and pass it on to me when I visit them how very kind of them to do this for me) coming back to the recipe the name was very cute I thought I do not know what Dhingri means if anybody knows please enlighten me. 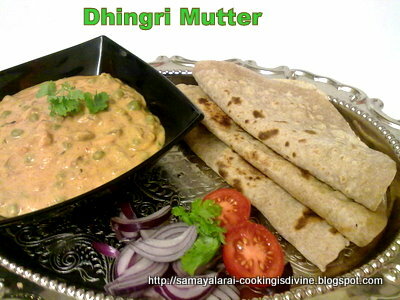 Well, anyway Dhingri Mutter with the parathas was very nice and tasty I do not know if it is authentic please write to me if I have missed out anything. Let’s get back to the recipe then. Oh! I forgot to tell you why I got interested about this recipe because it had Mushrooms, as we all know they are high in Folic acid and is good for women and my daughter loves it but other family members are not really have a Oh! yes feeling about it (including me 🙂 ). But, I try to include them now and then, and this one will definitely reappear in my kitchen as you can never ever guess it had Mushrooms in it!. Here is how the recipe goes…..
First of all wash the Mushrooms pat dry it, remove the stalks. Meanwhile boil the mutter with a 1 and a 1/2 cup of water, do not throw away the water just keep them aside together. Grind Onions, Tomatoes, Green chilli, Cloves, Ginger into a smooth paste. Then Grind poppy seeds and Cashews into a smooth paste with little water. (to get a nice paste properly you can soak both these ingredients in hot water before you start this subzi which gives ample time to soak well). Chop the Mushrooms into thin slices and chop the coriander leaves and get everything ready. Take a wok heat oil, then add the Ground smooth paste and fry it until the raw smell disappears and oil starts to appear around the edges as in the third picture below then add the sliced Mushrooms and fry them until they becomes soft. Then add all the Masala powders and give a fry for 2 minutes then add the cooked Peas with an extra 1/2 cup of water with the water already with peas. Mix well then add the smooth paste of Cashew and Poppy seeds and allow it boil with required amount of Salt. Do not leave the wok unattended as it may start thickening Once it starts boiling nicely for 5 minutes add the Fresh Curds mix well and leave it for another 2 minutes with continuous stir otherwise the curds may break, Garnish with chopped coriander leaves mix well and serve this lovely dish with chapatis, parathas or pulkas. It was very and tasted beautiful. I would love send this to Pari of food delicious who is hosting Flavours of Punjab started by Nayana of simply food. have heard about this but never ate or cooked, so thanks for the recipe.